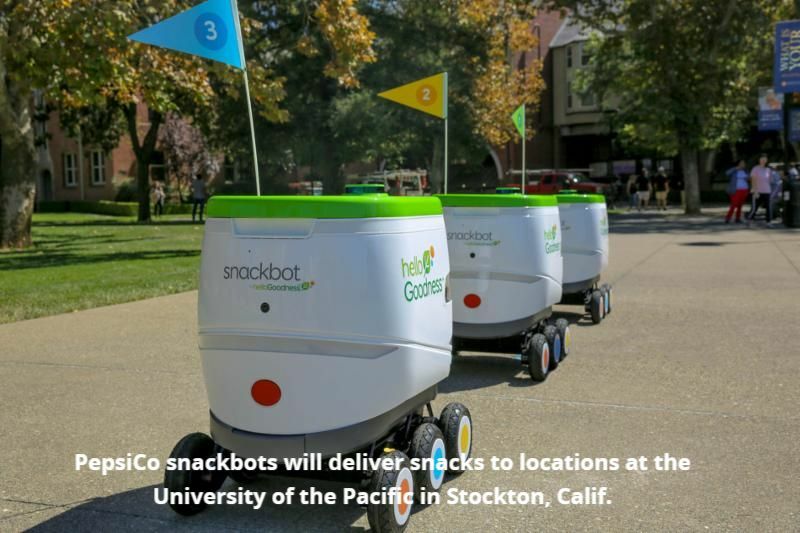 Students at the University of the Pacific in Stockton, Calif. will be receiving PepsiCo’s Hello Goodness snacks from self-driving “snackbots.” The university community can now order food and drinks from 9 a.m. to 5 p.m. via the snackbot app to be delivered to more than 50 locations across the 175-acre campus. The Hello Goodness choices include Starbucks Cold Brew, Baked Lay’s, SunChips, Smartfood Delight, Pure Leaf Tea, bubly and LIFEWTR. The snackbots, developed in partnership with Robby Technologies, have a range of more than 20 miles on a single charge, and are equipped with headlights and a camera that allow it to navigate in full darkness or rain, as well as all-wheel drive capabilities for handling hills and curbs. The ordering app is available for iOS with a University of the Pacific email address. PepsiCo products are enjoyed by consumers more than one billion times a day in more than 200 countries and territories around the world. PepsiCo generated more than $63 billion in net revenue in 2017, driven by a complementary food and beverage portfolio that includes Frito-Lay, Gatorade, Pepsi-Cola, Quaker and Tropicana. PepsiCo’s product portfolio includes a wide range of enjoyable foods and beverages, including 22 brands that generate more than $1 billioneach in estimated annual retail sales. At the heart of PepsiCo is Performance with Purpose – our fundamental belief that the success of our company is inextricably linked to the sustainability of the world around us. We believe that continuously improving the products we sell, operating responsibly to protect our planet and empowering people around the world enable PepsiCo to run a successful global company that creates long-term value for society and our shareholders. For more information, visit www.pepsico.com.